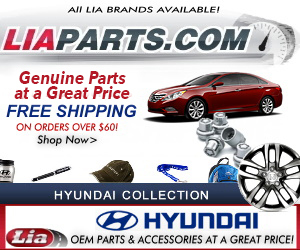 Lia Hyundai of Albany offers Genuine Hyundai Auto Parts and Accessories directly from the manufacturer and select automotive distributors to customers in Albany, Schenectady, Troy and Clifton Park. At Lia Hyundai of Albany you can get OEM (Original Equipment Manufacturer) Hyundai Parts for Any Hyundai Model, from Any Year. Because we sell and service Hyundai on-site at our Albany Hyundai Dealership, chances are our Parts Department has what you're looking for in stock. If it's High-Performance or Custom Accessories you want, our vast network of OEM Factory Hyundai Parts distributors can have your item delivered to us in just a day or two. The Lia Hyundai of Albany Parts Department will call you when they arrive and you can either stop by to pick them up or bring your vehicle in and we'll install your New Parts or Accessories while you wait. We're located on Central Ave in Albany, only minutes from anywhere near Schenectady, Troy, and Clifton Park NY. Manufacturer Recommended Hyundai Auto Parts and Accessories are a vitally important part of maintaining the highest performance in your New or Used Hyundai Car or SUV. We proudly offer the same High Quality Parts your Hyundai Vehicle was built with, and then some! And we have several factory-trained Hyundai Service Technicians' on-staff here in our Lia Hyundai of Albany Service Center to ensure the highest levels of professionalism in Vehicle Maintenance and Repairs. Our facility is a state of the art, clean and courteous customer-friendly environment, regardless of whether or not bought your car from us. Check out our Hyundai Parts Specials for Current Discounts and Savings. If you've never ordered or installed Hyundai Parts before you can check out our Parts FAQ section to find out why it's so important that you use Original-Factory Hyundai Auto Parts and Accessories from a trusted local dealer or supplier. So whether you want to personalize your vehicle, increase its performance, or improve fuel economy, our friendly and knowledgeable Parts Department will help you find just what you need. You can also Order Hyundai Parts & Accessories Online using our convenient Parts Web Site & Order Forms. If you need more than just the Parts to Repair your Hyundai, contact our Lia Hyundai of Albany Certified Hyundai Repair & Service Center at (866) 721-5317 and speak with one of our Parts or Service Advisors; or use our online Ask a Hyundai Service Tech form. We are located at 945 Central Ave, Albany NY 12205. Why Use Genuine Hyundai Auto Parts and Accessories Rather Than Cheap Aftermarket Parts? Using Genuine Hyundai Parts and Accessories, which meet or exceed Hyundai's performance standards, will never adversely affect your vehicle's warranty or re-sale value, and will help you avoid excessive wear-and-use expenses if you're leasing your Hyundai vehicle because they provide ideal fit, functionality, style and performance. Plus, Factory Certified Hyundai Parts and Accessories are all backed by warranty.